A funerary monument recovered in southeastern Turkey reveals that people who lived in Zincirli, an important Iron Age city, believed the soul was separate from the body. They also believed the soul lived in the slab. 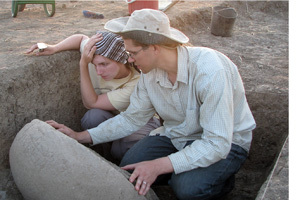 Virginia Rimmer and Benjamin Thomas, Ph.D. students in Near Eastern Languages and Civilizations, look at a stele recovered in Zincirli. The inscription on the stone reveals the first evidence that people in the region believed the soul was separate from the body. 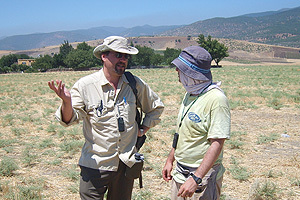 David Schloen (left), Director of the Neubauer Expedition, and Amir Fink, Associate Director, discuss the Zincirli site this past August. “The stele is in almost pristine condition. It is unique in its combination of pictorial and textual features and thus provides an important addition to our knowledge of ancient language and culture,” said David Schloen, Associate Professor in the Oriental Institute and Director of the Neubauer Expedition to Zincirli. German archaeologists first excavated the 100-acre site in the 1890s and unearthed massive city walls, gates and palaces. A number of royal inscriptions and other finds are now on display in museums in Istanbul and Berlin. Schloen and his team have excavated Zincirli for two months every year since 2006. “Zincirli is a remarkable site,” said Gil Stein, Director of the Oriental Institute. “Because no other cities were built on top of it, we have excellent Iron Age materials right under the surface. It is rare also in having written evidence together with artistic and archaeological evidence from the Iron Age. The stele was discovered last summer in a small room that had been converted into a mortuary shrine for the royal official Kuttamuwa, self-described in the inscription as a “servant” of King Panamuwa of the eighth century B.C. It was found in the outer part of the walled city in a domestic area—most likely in Kuttamuwa’s house—far from the royal palaces, where inscriptions have previously been found. It was written in a script derived from the Phoenician alphabet and in a local West Semitic dialect similar to Aramaic and Hebrew. It is of keen interest to linguists as well as biblical scholars and religious historians because the stele comes from a kingdom that shared with its contemporary ancient Israel a similar language and cultural features. The finding sheds a striking new light on Iron Age beliefs about the afterlife. In this case, it was the belief that the enduring identity or “soul” of the deceased inhabited the monument on which his image was carved and on which his final words were recorded. The stele was set against a stone wall in the corner of the small room, with its protruding tenon or “tab” still inserted into a slot in a flagstone platform. 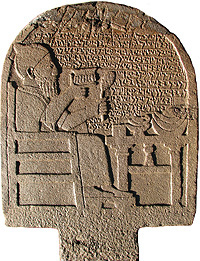 A handsome, bearded figure, Kuttamuwa is depicted on the stele wearing a tasseled cap and fringed cloak and raising a cup of wine in his right hand. He is seated on a chair in front of a table laden with food, symbolizing the pleasant afterlife he expected to enjoy. Beside him is his inscription, elegantly carved in raised relief, enjoining upon his descendants the regular duty of bringing food for his soul. Indeed, in front of the stele were remains of food offerings and fragments of polished stone bowls of the type depicted on Kuttamuwa’s table. According to Schloen, the stele vividly demonstrates that Iron Age Sam’al, located in the border zone between Anatolia and Syria, inherited both Semitic and Indo-European cultural traditions. Kuttamuwa and his king, Panamuwa, had non-Semitic names, reflecting the migration of Indo-European speakers into the region centuries earlier, under the Hittite Empire in central Anatolia (modern Turkey), which had conquered the region. But by the eighth century B.C., they were speaking the local West Semitic dialect and were fully integrated into local culture. Kuttamuwa’s inscription shows a fascinating mixture of non-Semitic and Semitic cultural elements, including a belief in the enduring human soul—which did not inhabit the bones of the deceased, as in traditional Semitic thought, but inhabited his stone monument, possibly because the remains of the deceased were cremated. Cremation was considered to be abhorrent in the Old Testament and in traditional West Semitic culture, but there is archaeological evidence for Indo-European-style cremation in neighboring Iron Age sites, although not yet at Zincirli. In future excavation campaigns, the Zincirli team, generously supported by University Trustee Joseph Neubauer and wife Jeanette, plans to excavate large areas of the site in order to understand the social and economic organization of the city and its cultural development over the centuries. Schloen and his associate director Amir Fink hope to illuminate Iron Age culture more widely through the richly documented ancient city.